Relatively obvious application. Elbow to the temple. The sequence begins with the opponent standing facing you, having a grip of your left hand, wrist or forearm with his right hand. Simply rolling your arm and bringing it across your body pulls the opponent into an arm bar with your left elbow on top of his right elbow. This is probably the most common application of the koshi kamae posture. 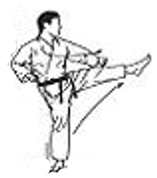 In most styles, the kata turns left and kicks with mae-geri. The Heian variant maintains a front face and kicks with yoko-geri instead. All kicks historically were low, and so are aimed at the back of the knee. Step forward and drive the knee to the floor. Place left hand on the opposite side of the opponent's head and then strike strongly with Mae mawashi empi uchi to the opponent's temple. This will at a minimum, render the opponent unconscious.